Heraclea Lyncestis is a town from the Hellenistic period and early middle ages, whose remains are visible near Bitola. 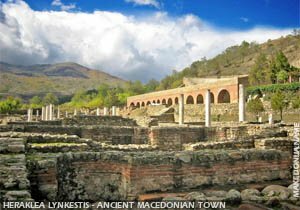 Heraclea Lyncestis founded in the middle of the 4th century BC, by Philip 2nd of Macedonia, father of the biggest Macedonian Emperor Alexander the Great, as important strategical town. At the middle of the 2nd century BC, the Romans conquered Macedonia and destroyed it's political power and then divided in 4 regions. And by this terrible condition, Heraclea Lyncestis which was in the fourth region, has got a high prosperity rating. Heraclea Lyncestis owns that with the establishment of the main Balkan road Via Egnatia on which Heraclea Lyncestis was important stop. Discovered objects from the Roman time in Heraclea Lyncestis are: Votive monuments, thermi (baths), theatre and identified, town walls. In the early Christian period Heraklea was important episcopical seat. Some of it's episcopes are mentioned in church meetings in Serdika, Evgarius, in Effes Quintilius and Beagnus in Carigrad. From this period are the ensembles of the small and big basilica. The grave basilica with necropolis are located eastern of the theatre. Heraclea Lyncestis votive monuments: that is porch, which roof lies on a wall and colonnades. On the wall are discovered several writings. In the western part is written: To the god Nemeza (monument establisher) Julija Tertila. On the second is written: the city of Heraclea Lyncestis establishes a monument of Titus Flavius Orestus (on the picture). On the third place in written: To the god of the Justice. Heraclea Lyncestis thermi: Eastern of the ensemble of the small basilica is discovered the western side of the thermi (baths), divided on: 1.place with cold water (frigidarium); 2.place with a mix of cold and hot water (tepidarium); 3.place with hot water (caldarium) and 4. three fire places (praefurnium). The entrance has still not been discovered but it's believed that is on the eastern side. Dating period not known, around III or IV century. Heraclea Lyncestis theatre: built by the Roman types of theatres. It is an urban building located in the central part of the town, which shows representative and practical ideas of the Roman theatre architecture. 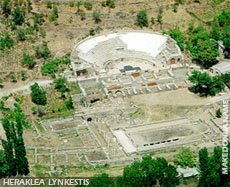 This theatre is built in time when in Macedonia and Greece the old theatres are modernizing, in the time of the Roman emperor Hadrian. And given in use in the time of Antonius Pius. The theatre is located on a hill, with southern exposition. The first material prove of existing of the theatre was bone ticket for a seat in the 14th row (ID DIIII), founded in 1931. Second prove are seats built secondary in the big basilica, founded in 1936-1938. The theatre has been discovered in 1968. It has 20 rows seats. The wall that separates the orchestra from the scene is 2.10 meters high. On this wall have been discovered 3 cages for animals and in the western part a tunnel. The theatre is left for use in the period of changes on the king Honorius, when the bloody gladiator fights have been stopped. So on the place of long time closed theatre in the first half of the 6th century have been built several Slavic houses. Heraclea Lyncestis small basilica (Basilica A): This building is discovered in the researches made before the second world war in 1936-1938 and in the beginning is identified as late ancient palace, but in the final researches in 1960-1964, it has been found out that it is a old Christian basilica. There is a decorated floor mosaic made by the technique "opus sectile". There have been discovered several rooms. The first has been used as baptistery service and the second on west has floor mosaic made by the technique "opus tessalatum". After creation of the complex Big Basilica, the function of these rooms has been changed. By discovering of the walls, architectonic plastic and floors, are reconstructed. The floors of these rooms have a mosaics made with wonderful quality, made in technique "opus tessalatum" with geometrical and floral motive. 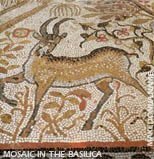 The mosaic in the narthex is old Christian art, a big composition and size about 100 square meters. There are birds, trees, bushes, red dog (symbol of paradise) and animals beasts as a domain of the earth. 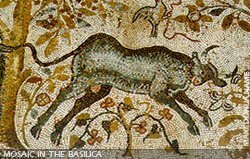 This mosaic is dating from the end of the 6th century. The basilica C is built on older basilica B. The basilica C has been in use in the period of 4th to 6th century. Heraclea Lyncestis basilica D: It is located in the eastern part of Heraclea Lyncestis. It has been built under ruins from the late ancient period, in the first half of 5th century. Floors are made different. Some of them have mosaics, some with stone blocks and bricks. 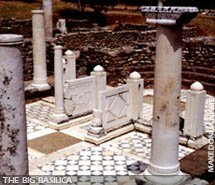 Near this basilica have been discovered old Christian and Slavic graves. The basilica is dating from the first half of 6th century. Heraclea Lyncestis episcopacy residence: archeological researches have been made in period of 1970-1975. First was discovered the western part and the southern side is near the town wall. The luxury rooms are located in the eastern part. The rooms 2, 3 and 4 have mosaic floors. Between the rooms 3 and 4 there was a hole that leaded to the eastern entrance of the residence. This object has been in use in the period of 4th to 6th century.